Do you mulch your garden? What about your trees and shrubs? If not, you are creating more work for yourself and making it harder for your plants to thrive. Mulching can save you time, improve your land, and foster abundance in your garden or homestead. Keep reading to learn what mulching is and the pros and cons of mulching and how to make it work for you. I love mulch. In fact, I hate it when I don’t have a large pile of wood chips or fall leaves sitting on my homestead waiting to be spread out. It just feels wrong not to have a supply of mulch on hand. But even if you don’t go all in for mulch like me, putting mulch on your garden, around your trees, and on your lawn can be a fantastic way to save you time, energy, money—and improve your soil. By using mulch, you will be mimicking nature’s processes for keeping soils rich and plants healthy, which will always boost your homestead. As always, I made a free, easy-to-print cheat-sheet that summarizes this post (so you don’t need to take notes). It also has a list of resources and covers the different types of material to use as mulch and how to use them. Signup to get your cheat-sheet today so you can start working with nature by mulching. Here is one of my favorite things--massive piles of wood chips ready to serve as mulch around my plants. Mulch is material that you spread over the ground as a cover. Mulch can be either organic, (like wood chips, fall leaves, straw, etc.) or inorganic (like black plastic, rocks, etc.). Mulching is what you’re doing when you spread it over the ground. Mulch should always stay up on top, not buried or tilled into the ground. That would cause the amount of available nitrogen in your soil to decrease, which can negatively impact your plants. Part 2 in this series on mulch ​will cover the different types of material you can use for mulching. I tend to focus on organic materials. Other than rocks, I’m not a fan of using inorganic material as mulch, and even rocks should only be used in specific situations. Inorganic mulch can cause problems over time, and it doesn’t improve the soil like organic mulch will. So for this post, I’m assuming you’re using some sort of organic mulch. Basically, that means the mulch is made up of old plants or animal waste. There are 3 main ways to use mulch that will benefit your homestead. But before you start using mulch on your homestead, let’s cover the general advantages and disadvantages of mulching. Mulching new plants like these growing on one of my hugelkultur beds provides a lot of great benefits. The big advantage of mulching with organic mulch like wood chips is that it feeds the soil life which builds your soil and feeds your plants. When you mulch this way, you are working with nature and creating long term abundance on your homestead. Mulching with organic materials adds organic content to your soils. In addition to feeding the soil life, this also helps the soil hold onto water without becoming water logged. Plus, mulch reduces evaporation, which further helps your garden retain water. If you want to transform your garden into a low water garden, then you’ve got to start mulching. Reducing how much water your plants need is a major advantage of mulching. Mulching can help keep down weeds, saving you (and your plants) time and energy while you’re waiting for them to mature. When combined with newspaper, cardboard or burlap bags (all of which will break down into soil) mulching can be done in a method call sheet-mulching, which is a fantastic way to prepare land for planting. It can smother undesirable plants while setting the stage for your future planting efforts to thrive. Feeds soil life, building soil, and provides nutrients to your plants. Increases the percent organic material in the soil. Reduces evaporation, increases water retention of the soil, and reduces drought stress. Can be used to prepare sites for future planting. I’d be lying if I said there were no trade-offs… Mulching can result in an increased number of pests like slugs and pill bugs, since you’re creating the perfect habitat for them. This tends not to be a big issue with wood chips, but it can be an issue with fall leaves and straw or hay. But this is not a permanent disadvantage of mulching. Over time, the predators that eat those pests will increase, resulting in a new balance. The biggest disadvantage of mulching is the time, energy and potential cost of getting the material. Later in this post I will share some ways to get mulch for free, but one way or another, you will need to gather and spread the mulch. This all takes time and energy. The benefits of mulch will save you time and energy in the long-term, but you have to get past the up-front investment. Another potential disadvantage is the possibility of introducing contaminated materials—materials that have pesticide or herbicide residue on them, or other chemical residue. Straw and animal manure are the types most likely to have this issue. Wood chips are generally safe. Diseases are generally not spread through mulch, but to be safe, I would avoid mulch from diseased plants. That said, I’ve collected tons of mulch (literally) from outside sources, and so far I haven’t had any issues. I don’t worry too much about wood chips, but I don’t use straw anymore because of the potential for problems. It is also harder to direct seed your garden when the garden is heavily mulched. You will need to pull the mulch back so you can sow the seed into soil and not into the mulch. Light rain or watering may only wet the surface of the mulch and not the soil below it. But this is only an issue after a long drought or when using overhead sprinklers. Drip hoses placed below the mulch is an effective and efficient way to water a mulched garden. A quick note about mulch and nitrogen. If you search on google, you’ll probably find people talking about how mulch reduced the nitrogen levels in their soils. As long as you don’t till in the mulch or bury it, you shouldn’t have any issue. Just be careful when planting, since the mulch can fall into the hole. Can cause pest population to increase in the short run (but decrease in the long run). Mulching takes time and energy to collect, transport, and spread the mulch. May cost money too depending on the source of the mulch. May introduce toxic chemicals to your garden depending on the source. It is harder to direct seed when a garden bed is covered with mulch. Light rains and overhead watering may just wet the mulch and not reach the soil. Mulching the garden will do wonderful things for your harvests, as long as you follow some important rules. First, most seeds can’t be sown into mulch. This means you’ll either need to wait to mulch until you’re done sowing seeds or move the mulch aside. As long as you’re careful about this, then mulching won’t be an issue. Always plant plants or sow seeds into the soil, and not into the mulch. Mulch is great for helping to insulate the ground (and your plants!) from cold weather. This makes it easier to overwinter perennial vegetables and manage a winter garden. The flip-side is, you may also find that mulch may keep your soil from warming up as quickly in the spring. Because of this, you may want to wait to add mulch until your garden soil warms up. Just make sure you get the mulch on before the rains stop. I’m not going to lie—mulching the garden can be a bit tedious, but it’s well-worth the effort. For me, the slow, methodical process gives me time to clear my head and take in the ever-changing wild world around me. And when it’s time to harvest, all my hard work pays out in dividends. Remember, mulching can build your garden’s soil, feed soil life, and act like a slow-release fertilizer for your plants. It will reduce how much you need to water, and it can also help keep down weeds. By mulching, you are mimicking nature’s tried-and-true system for enriching soils and fostering abundance across millennia. Your garden will thank you for it. This is the front planting area at my place. The trees, shrubs, and other plants are thriving with a thick wood chip mulch. More plants have been added since this picture and all the plants have grown in what used to be a gravel and grass mix. In many ways, this is a no-brainer. Mulch will help reduce the need for watering, build the soil, and help suppress unwanted weeds that would compete with the trees and shrubs for resources. And unlike when you’re planting seeds, you don’t need to be as careful about leaving room for a delicate new seeding to emerge. But mulch also offers another incredible and surprising benefit for shrubs and trees—fungi. For the most part, trees and shrubs are adapted to grow in soil that is teaming with fungi, but too often our degraded soils are lacking these vital participants. Fungi help plants by connecting with their roots and giving the plants water, nutrients, and minerals that the plants may have trouble getting on their own. Essentially, the fungi become an extension of the plant’s roots. The fungi even allow the plants to share nutrients between each other! By mulching around your trees and shrubs, you’re creating the environment fungi need, which will in turn benefit your plants. If you want to learn more about this, I highly recommend the book Mycelium Running: How Mushrooms Can Help Save the World by Paul Stamets. These unsung heroes never cease to amaze me. Mulch will help you bring them to your garden. Beyond this, as you know, the mulch will also build the soil and reduce any watering you may need to do. A great way to build this mulch layer around trees and shrubs is through a method called chop-and-drop. Instead of hauling away branches and leaves when they fall or are pruned, just leave them on the ground around the plants to build mulch. 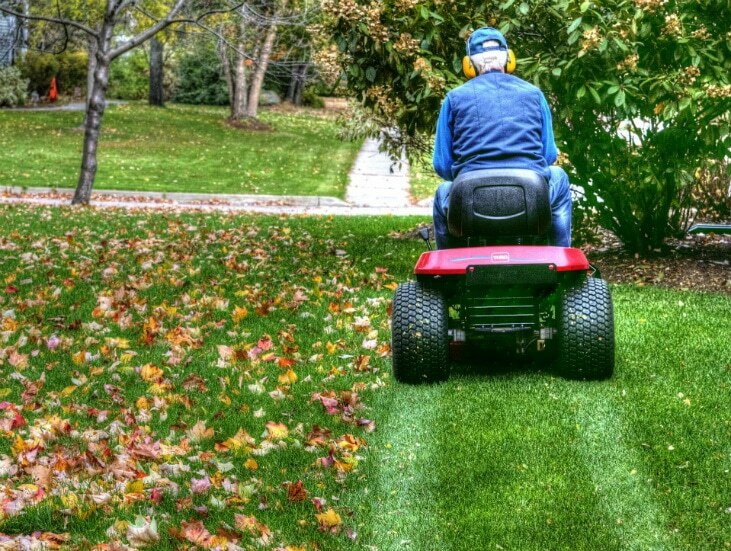 Mulching lawnmowers can chop up the leaves so much that they just disappear into the grass. No need to rake and remove the leaves. Image - CC0 Public Domain Picture. I hope you are seeing a theme by now—there are a lot of great advantages to mulching different areas of your homestead or garden. But what about the lawn? It turns out that even the lawn can benefit from mulching. The easiest way to do this is to leave your grass clippings on the lawn after you mow. Don’t bag them up—just let them sit and decompose. The grass clippings will feed the soil life and build soil, which will in turn fertilize your grass and reduce how much water you need to give it. A mulching lawnmower is an easy way to achieve this if you’re concerned with having the grass clippings on the surface. To give your lawn an annual boost, you can also do this with any leaves that fall on your property. Just run your lawnmower over the leaves and chop them up so they will quickly breakdown to help build soil and feed your grass. This is a lot easier than raking up all those leaves! I can never get enough wood chips for mulch. So, does mulching sound great to you? I bet by now you’re likely wondering where you can get all this material for mulching. This is the biggest downside of mulching. Of course, if you’re mulching a lawn with grass clippings or a mulching a shrub with the cuttings you’ve just pruned, then you’ve already got this part covered. But if you’re doing a more substantial project, trying to come up with the sheer volume of material you need can leave you scratching your head. Luckily, there are plenty of great ways to get mulch. The first is to practice chop-and-drop anytime you are cutting and pruning your plants. This includes when you put your garden to bed at the end of summer. Leave any fallen branches on the ground or place them around your trees. This is essentially nature doing the chop-and-drop for you. Fall leaves are an amazing source of mulch that many people just get rid of. If they fall where you don’t want them, then just rake them up and place them around your trees and shrubs or save them and make leaf mold for your garden. I used the site Nextdoor.com to connect with people living in my area, which allowed me to collect well over 200 bags of leaves to use on my homestead. Wood chips can be a bit harder to find but, there are probably places in your area that have free wood chips you could get. Plus, you can reach out to any service that cuts down or prunes trees for people, since they often want to get rid of the wood chips after a job. ChipDrop is a great site that can help you get deliveries of wood chips for free or low cost by connecting you with local arborists. You might also reach out to local farmers and see if any of them have old, moldy straw that you could haul away to use as mulch. Just ask if they use any chemicals first, just to be safe. So, are you ready to get started with mulching? If so, don’t forget to grab your free, easy-to-print cheat-sheet that summarizes this post (so you don’t need to take notes). It offers a list of resources and covers the different types of material to use as mulch and how to use each. Sign up to get your cheat-sheet today so you can start working with nature by mulching. 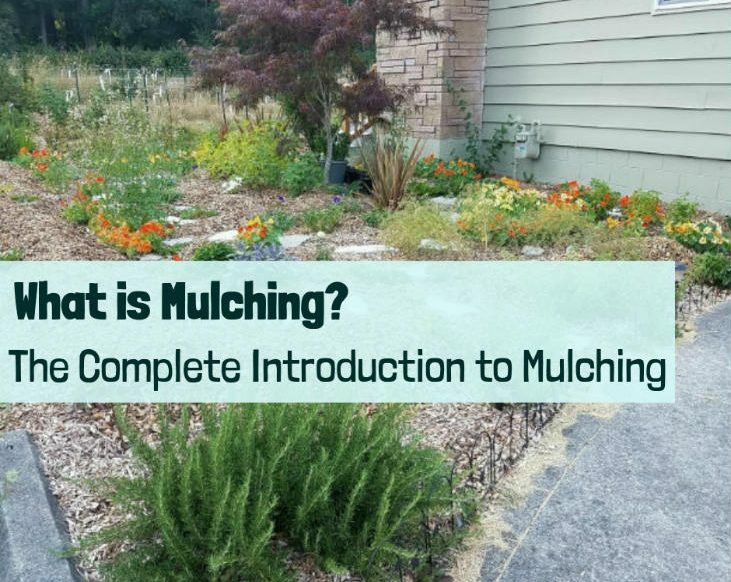 And don't forget to check out part 2 of this 2 part series on mulching. Part 2 covers the different types of mulch and how to use them. Thank you and good point about using plastic for warming up the beds. I admit I’m not a fan of plastic sheeting but it does have its uses and I have used it to prepare land for planting through solarizing. One reason I’m wanting to use leaf mould as a mulch on my garden is that it is darker and I hope it will help the beds heat up a bit more than lighter colored mulch. I’m also using raised beds which should help the beds warm up too. The next mulch post does not focus on using cardboard or burlap bags but I do want to write a post later on that focuses on using those types of materials. I have used both cardboard and burlap bags on my property but I tend to cover them with wood chips or other types of mulch. You are right about both being great for mulching. I’m thinking about writing a 3rd post to go in this series that would be about sheet mulching which would cover using cardboard and burlap bags. Great new article! As the season draws near, we’re prepping our beds and walkways for a few extra yards of mulch to simplify our lives. In the past, we’ve even gotten free wood chip mulch from the highway department- they love giving the stuff away because that means they don’t have to dispose of it after clearing the roadways. We grow strawberries when we can, and mulch is extremely important to a good bed’s health. Thank you! Nice! I’m still waiting for the recent snow to melt so I can get back to mulching on my homestead. I really need to try reaching out to my area’s local highway department – that is a great idea! Just wanted to add – I went and checked out your website today. Really enjoyed reading through your articles 🙂 Those are some good rules to follow on your 8 Modern Homesteading Family Rules We Mostly Follow post. My family mostly follows those but we still need to get chickens so at the moment I’m trying to setup a better way to compost our kitchen scraps. But in the future they will go to the chickens! WOW! Great information on improving your soil health! Thanks for sharing on Homestead Blog hop! Thank you! 🙂 I have really enjoyed the blog hop and seeing what everyone else has been sharing.